The third in Dr Brown’s series of pocket-sized part guide-part local history volumes moves logically inland from the coast of the previous collection, to its hinterland, the traditional county of Aberdeenshire. Thankfully, that’s quite deliberately Aberdeenshire as a historic, geographical and cultural entity, not the current local governmental administrative mess. The author even admits that she has twice breached this traditional boundary and featured items of Kincardineshire lore, although, I’d argue too that Rothiemay, whose Parson Gordon’s place in history as a cartographer is featured, is across the Deveron, and is in my beloved Banffshire. That petty quibble aside, like its predecessors, Dr Brown’s output is easily read and superbly informative. Discrete geographical areas are defined, their tales and attractions grouped, and a short day out by car should enable readers to make their way round most in a relaxed drive. For those who want to research further, a welcome and comprehensive bibliography is provided. The second Hidden Aberdeenshire volume continues to maintain the perfect balance of geographical and historical contexts with the personal tales of individuals, variously heroes, villains and innovators. Little-known or long-forgotten tales of murders, burials, personal and architectural triumphs and follies, simply-illustrated, will whet the appetites of those keen to broaden their knowledge of the rich history of the ancient county. The origins of the Consumption Dyke at Kingswells, the fate of enemy airmen shot down over Aberdeen in July 1940 and the tragedy of the Inverythan Bridge train crash are only three examples of Dr Brown’s ability to distil down to 450 words vital pieces of hitherto-hidden NE history. And great credit is due to her for raising a smile at her ingenious description of 19th century bothy ballads as the Trip Advisor of their day! 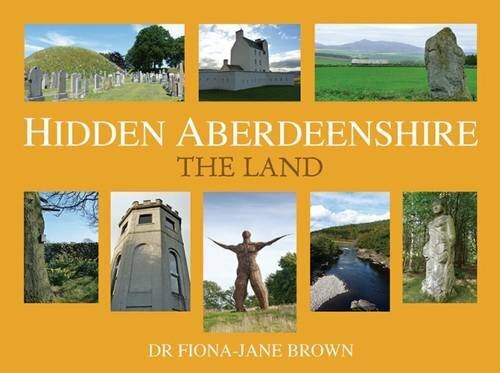 Hidden Aberdeenshire: The Land is a further triumph for Fiona-Jane Brown. With her instinct in knowing what readers will find fascinating, her economy of content, accessibility of style and sharp-eyed research, readers will hope that the NE’s rich heritage will continue to inspire her to add to her already-impressive canon.